I’m super excited to be reviewing another fabulous and hot new kosher cookbook, CHIC Made Simple . The author, Esther Deutch, actually writes for the same magazine as me, Ami Living’s Whisk magazine. Oddly enough, I didn’t meet her until Kosher Fest, when we practically bumped into each-other. “You’re Overtime Cook? !” She exclaimed. “I am such a fan.” Well. After an introduction like that, I couldn’t wait to see her beautiful cookbook and try some of the recipes. CHIC Made Simple is beautiful. And I am not talking simply about the pictures (which are really nice!). This book is big, hard covered, and really nice all around. Every page has a recipe and a full page picture. Every picture is beautiful, the lighting, the coloring, and most importantly, the styling. This book isn’t just a book of recipes, it’s a book of fabulous food ideas. Say you don’t feel like making the Mushroom and Bell Pepper Lettuce Salad, you see a beautiful picture of salad arranged in a row of martini glasses, and the inspiration is there for your next party, whichever salad you want to make! On each page, next to the recipe, there’s a box with some information about the recipe. On some pages, there’s an interesting tidbit about the ingredients (did you know delmonico steak isn’t a specific cut of meat, rather the name for the most prized cut on hand?). On some pages there’s a personal story about the author’s son and how much he enjoyed that particular cookie recipe. On other pages, there’s some advice about working with the ingredients in the recipes, and some have humorous anecdotes, such as the author’s friend texting her that she was dreaming about the salad recipe. In some cookbooks, I feel like the introductions to the recipes are very contrived, but in the case of CHIC I actually enjoyed reading all of them. I also enjoyed the creativity of this books. While there are some old standbys like Penne a la Vodka and Chocolate Chip Pudding Cookies, there were a lot of recipes that made me mutter that’s a really good idea to myself. Some were even good enough that I chided myself with a why didn’t I think of that? Esther uses a lot of interesting a new ingredients, and combines lots of others in way I wouldn’t have imagined, and the results of mouthwatering and beautiful. Although I don’t usually do this, I took pictures of the recipe’s photo in the book, to give you a taste of the beautiful styling! I love sweet potatoes, and am beyond excited to try the amazing looking dipping sauces! Also, how amazing is that way of serving fries for a party? Suddenly they look elegant! I love dips of all sorts. Also, I love eggplant dip, and I love red pepper dip. This is totally happening soon. It’s no secret that I am a total grilled chicken fan. Also I love peanut butter, so that barbecue sauce sounds completely out of this world. Also, I feel like a broken record but how amazing is that for serving simple grilled chicken at a party?! This recipe is super clever. It’s a favorite pasta dish turned soup. I might just make this one for my family’s Hanukka party! Ok, you all know that I am a sucker for beautiful desserts. Well how pretty is this one? PS: it uses pre-made puff pastry, so it’s not too hard to make! CHIC Made Simple is a great option for any cook, specifically a Kosher cook, who enjoys to create delicious food that also looks great. It is particularly a good option for anyone who frequently hosts parties, and wants to really take things to the next level. 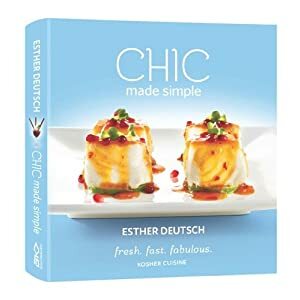 CHIC Made Simple is also a good option for anyone who feels bored with their recipes, and wants to spice things up with lots of creative ideas. This book has a lot of recipes that are more elaborate than your average dinner time quick and simple favorite, so it’s not the greatest option for people who are simply looking for that type of recipe. The book doesn’t really cater to any special diets, so if you are gluten-free, sugar-free, carb-free, etc, this book will have a lot of recipes that you won’t be making. Also, the book is a Kosher cookbook, and some of the recipes are more traditional Kosher recipes (or cool takes on it, like Gefilte Fish Sushi) and might not be of interest to a non Kosher Cook. The book is called CHIC made simple, but I think it delivers a lot more on the chic promise than the simple promise. Some recipes are indeed simple, but lots of recipes are more complicated recipes. The other main issue I had with this cookbook is the photography. While the majority of the pictures are beautiful, they weren’t all taken by the same photographer, so there was a slightly disjointed feel to the book. To be fair, this is something that I, as a (novice) food photographer, notice much more than most readers would, but still, it’s an issue I had. And lastly, as I often mention in cookbook reviews, there weren’t many dietetic recipes in this book. Again, this is a personal preference coming from a perpetual dieter, but it’s something to be aware of. CHIC made simple is a gorgeous cookbook with beautiful pictures and creative ideas, both in ingredients and serving. I don’t think this is a book I’ll pull out when I need a quick and easy supper idea, but you can bet I will turn to this book every time I make a party, cook for a holiday, or even need to impress a guest. Want to win a copy of CHIC Made Simple? Scroll down past the recipe for your chance! Let’s talk a bit about this recipe. I chose it because it looked delicious, and also because it so perfectly illustrates the cool ideas in this book. When I first saw the picture, I was like, ok, a slider. Yawn. But then I looked closer. And noticed that the “bun” wasn’t a bun at all, but a mushroom. Brilliant, right? Also a great option for an appetizer when you have gluten free folks around! Adapted from CHIC Made Simple . Preheat oven to 350. Remove the stems from the mushrooms, set aside about 15 of them, and discard the rest. Spray a cookie sheet with non-stick spray. Place the mushrooms on the pan. Drizzle them with Worcestershire sauce, salt, and pepper. Bake uncovered at 350 for 25 minutes. Remove from oven and set aside. 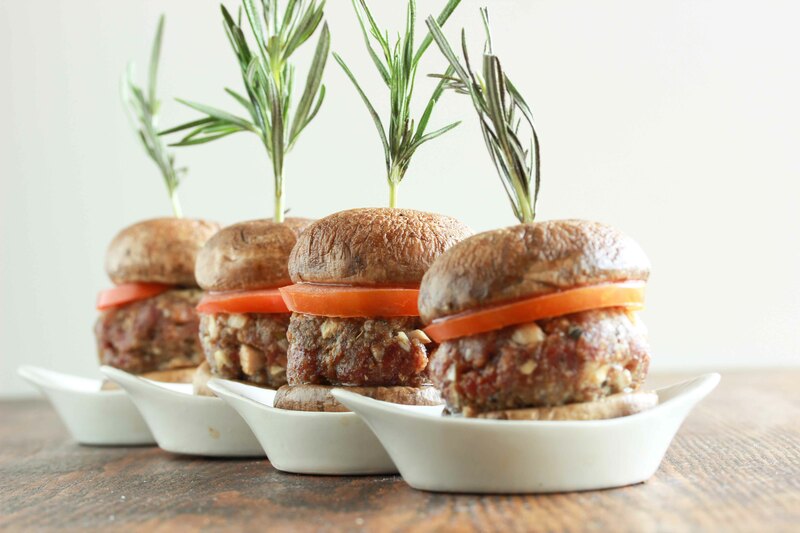 While the buns are baking, prepare the sliders. Heat a grill or grill pan, or oil in a frying pan to medium-low heat. Mix together all of the ingredients for the sliders until combined. Form small patties, about the size of the mushrooms. Grill or fry until cooked through at the level of done-ness you prefer. Remove from pan. When the sliders and mushrooms are done, assemble them. Spread barbecue sauce on the inside of each mushroom. Place a slice of tomato on top of a mushroom. Layer it with a slider and a basil leaf if using. Top with another mushroom. Stick a rosemary sprig through the entire thing, both for decoration and to keep it together. And now…for the giveaway! Please read the directions carefully. All entries must be made through a comment on the blog in order to be counted. Multiple entries in one comment will only count once! Entry #1 – Leave a comment on this post telling me about a dish you have made/served at a party or event that was very popular. Giveaway ends at 11:59 PM on Saturday, December 8th. A valid email address or twitter profile must be provided. Disclaimer: The author sent me a copy of this book to review, free of charge, and is also sponsoring the giveaway. All opinions expressed in this review are my own. There are affiliate links within this post. Everyone loves when I make a salad bar at my parties. 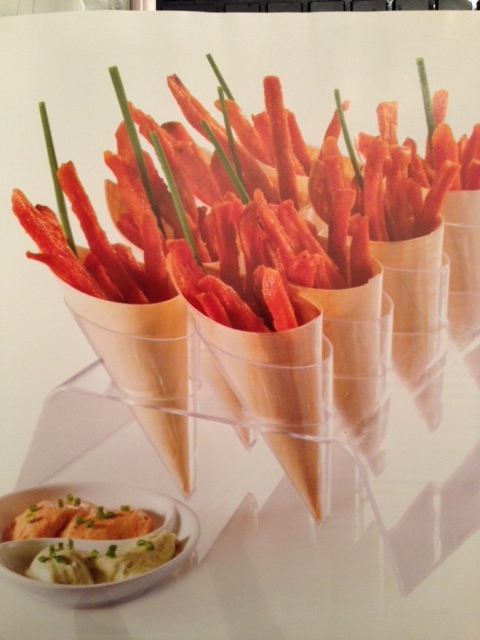 i love finger food at parties; think coctail franks, egg rolls. I would love to win this cookbook, but can I just say that those sliders look raw?! Not so appetizing! I make choc chip cookie sticks and they are always a huge hit! I also add in alot of fun things, like sprinkles and marshmallows, even though I always make a ton, everyone always asks for more! I liked “Tales of an Overtime Cook” on facebook! I subscribed to OvertimeCook via email! we made a smoothie bar at my shul’s melave malka last night. it was a huge hit! I made couscous stuffed mushrooms (yum!) – they went so fast, I should have made more! Simple chocolate chip cookies are always a hit! I subscribe to overtimecook’s emails! After making big fancy buffets with elaborate desserts i always like to make something simple and those are my chewy cholate chip cookies. No matter how many i make they always seem to disapear even after a HUGE meal! i just started following you on twitter!! iM following you on pinterest!!! So excited to go through your pins the boards look great!! I make a molten chocolate cake that my family just loves! My daughter makes amazing parties. I am spoiled. I usually do the fruit platter. One recipe that I’ve made that went over really well at parties is good old fashioned popcorn made in a pot on the stovetop. I already like overtime cook on Facebook. Plus I follow your blog. great review miriam! im also giving away a copy on my blog…ill add you to the blog post so people can enter here as well! I made mini cheesecake chocolate cupcakes and everyone loved them! I suscribe to your emails! I love making parties, and they are usually very well received, so it’s hard to pick. For dairy parties my delicious iced-mocha is always a huge hit! Also the dessert bar is always a favorite. Lots of minis and hot apple cobbler, cookies etc. Everyone loves my brisket…even me. It takes 3 days; day 1 is marinade; day 2 is cook; day 3 is rewarm. All of this makes a tender, tasty brisket. I do get your emails, follow you on Facebook, receive your emails, just re-pinned from your Pinterest “Coffee” Board (will be back), just tweeted about giveaway (didn’t want to, as I want to win this great recipe book..LOL!). Enjoy your posts and recipes. 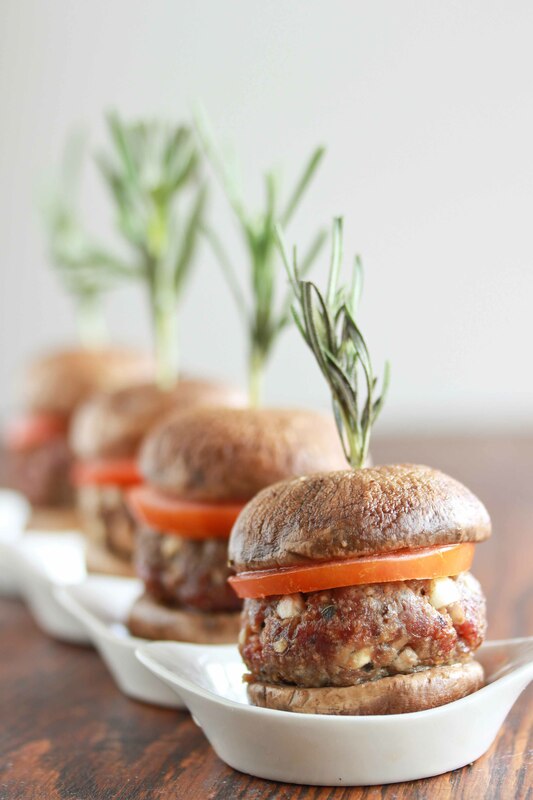 Just pinned slider recipe…will be making them for hubby. Thanks for your enjoyable blog. and i subscribe to your emails! I love making piña colada for parties, and everyone loves when I make it. I make apple cake and it’s a huge hit! i subscribed to overtimecook’s emails! These sliders are amazing! People always like dips at parties–that’s my go-to, probably. I’ve made hushpuppy muffins- corn muffins with a hot dog inside- always a big hit. I love making miniature everything, particularly hors doeurves… no matter what they are noone can resist anything served on a stick. I make mini twice baked potatoes for apps and everyone always gobbles them right up! These sliders are adorable! Chocolate covered pretzels – incredibly easy and incredibly delicious. A BIG hit at parties! My simple sweet noodle kugel is always a hit! My parve ceasar salad is always a big hit at parties! my pecan pies are always a huge hit! My mini chocolate mousse trifles are always a huge hit at parties! I recently made grilled veggies in mini cups along with different dip that eeryone loved! i like tales of an overtime cook on facebook! 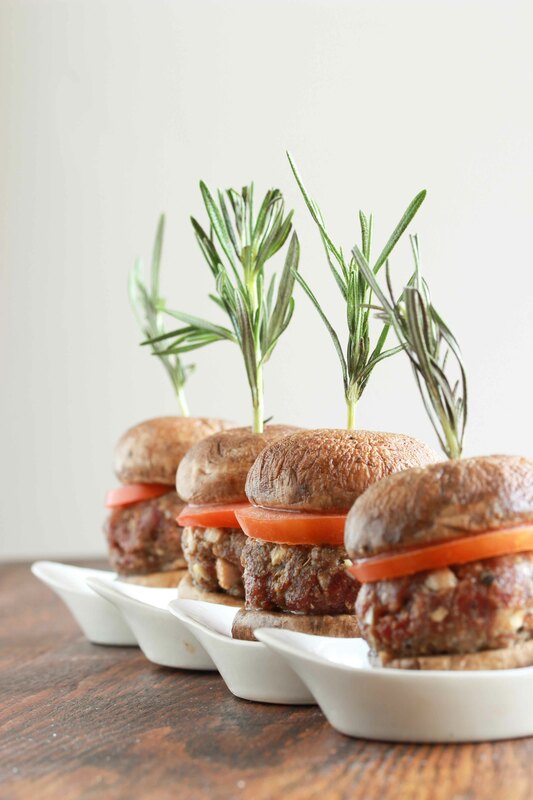 Those sliders look awesome– what a great part food! Brownies are always a hit at parties! Everyone loves my skirt stake with asparagus and potatoes!! Roasted Garlic Cauliflower soup! Awesome! I made a macroni salad once that was a smash hit. Pity it was improvised and never came out quite the same again. I can still do a decent job but it’s never been the same. does following the rss feed count for anything?? I made a salad bar with all kinds of toppings and dressings at a family get to gether. It was a real hit! Peanut chews are always a hit! Id love a new cookbook_! The last time I made a party I served rumballs. Boring? Well I tried a new brownie recipe but it flopped. The rumballs were heaven tasting and looked beautiful! and I make chicken wrapped around pastrami and mustard, dipped in an egg-mustard mixture and breaded – comes out great! Sesame beef, and the pesto pinwheels from your blog! fire popper chicken always a hit!!!! my dips always go as well as chocolate mousse trifles, yum! My son’s pusher in had a super salad bar that everyone loved! My stuffed mushrooms can be made dairy or parve and are always huge hits with the party finger food set. Thanks for running this giveaway!! Crinkle cookies r always a hit! Chocolate babka bundt cake.Definitely one of the nicest looking desserts I have made. Apple blueberry crumble – I either make it for dessert served warm with vanilla ice cream or as a kugel for shabbos. Either way guests always love it.. Made it for a yartzheit dinner a year ago and still get and requests for it ! I made a delicious coffee cake. Thanks for the great review! I subscribed to the overtime cook newsletter via email. Pistachio pasta salad. Every time I make it, it disappears. i love, love the idea of the mushrooms buns, perfect for the low carbing family..
A fruit salad so simple it was almost embarrassing … people gobbled it up. I love your mock breaded cauliflower, and I started making it with mushrooms, and also with baby carrots!! I cant wait to see what u come up with on facebook,, say HI to your latest fan! I made mini franks wrapped in pastrami- such an easy recipe and everyone loves it!